A lot of times gamers are sold on the media pitch of a game console's price. During the initial announcement of the device or at the following E3 event, we usually get a rough window of what the pricing structure will be for the console and the console alone. Well, as you all know, a console without games or a controller or a charge kit is a useless console. So now it's time to add up all necessary accessories and features so you have a working, usable console at launch. As we all know, the Xbox One and PS4 carry price tags at $499 and $399 respectively. However, those prices are just for the day one edition launch systems and it doesn't include things like taxes (which can vary per state and country) or accessories like online services and controller battery packs or charging kits (which are kind of necessary if you actually want to play games for more than just a few hours). So let's get to the breakdown and see how much you're really paying for a launch experience to actually experience each console. We'll start with the Xbox One. $499 for the console. You'll need the console, that's a given. It comes with everything necessary to get your box up and running. That includes Kinect 2.0, a wireless Xbox One controller, two AA batteries, a power brick, a single HDMI cable to hook up to your PC and a free 14 day trial of Xbox Live. $5.99 for a month of Xbox Live Gold. 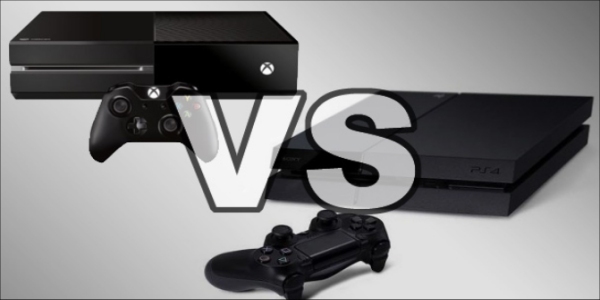 The 14 day trial is nice but given that all the media hub features of the Xbox One are behind the pay wall, most people will want to experience things like Skype, YouTube, Hulu, net browsing, video recording and uploading as well as live-streaming and online multiplayer gaming. You may not be able to get around to using all the Gold apps, so a month's time to actually experience those features is an adequate amount. It gives users breathing room to see if they like all of what the Xbox One has to offer. $24.99 for the play and charge kit. It goes without saying that you're going to need a rechargeable battery pack for your Xbox One controller. AA batteries last for a couple of hours of extended play and then they die. Now I usually keep rechargeable batteries on hand since wireless controllers eat through them pretty quick, especially when they have rumble features. The next best thing to rechargeable batteries is the play and charge kit. Some users might be able to stave off the wear and tear off battery use by opting for relying on Kinect, but you can't play controller-based games with Kinect. The P&C kit is a necessary evil, and since the connector is proprietary, you won't be able to Jerry-rig charge kits you used for the PS3 or Xbox 360. Trust me, I tried. $19.99 - $59.99 for a game. While having a new console is nice and all, you can't do much with it without games. There are no free-to-play games available for the Xbox One. There is a short demo of Killer Instinct but the game itself will run you $19.99, which is as cheap as it gets for launch titles. The highest is $59.99 for a full priced AAA title. If you're a casual you might be able to settle with something like Powerstar Golf for $19.99, but if you need a real game to play you'll probably want to pick up something like Battlefield 4 or Assassin's Creed IV and take the $59.99 plunge. Up next is the PlayStation 4... let's see how that rolls out. $399 for the console. Again, this is the launch day system and it includes a lot more than you may have been anticipating. You get the console, you get a controller, you get an HDMI cable so you can hook it up to your TV and you get the power cable. There's also a $10 PS Store promotional card and a free month of PlayStation Plus included. Surprisingly, you also get a rechargeable battery pack in the controller and a micro-USB charge cable, too. $0 for a month of PlayStation Plus. You won't need to spend more to find out if PS Plus is your cup of tea. The 30 days of free service will enable you to experience multiplayer, discounts, free games and more. The promotion code is included in package. Additionally, even without PlayStation Plus you still have access to third-party apps such as Hulu, Netflix and some media streaming services, something that was announced by Sony back during E3. $0 for a charge kit. Sony included a rechargeable battery pack with the DualShock 4 controller, so you won't have to buy a set of rechargeable batteries or a charging cable since they included one in the package. I thought it was very odd that Microsoft didn't include the cable in the package, especially considering that the controller runs on AA batteries. This was a very smart move by Sony. $0 - $60 for a game. The PlayStation 4 launched with a few free-to-play games, so even if you're strapped for cash after picking up the system you won't have to spend a dime on any games. Alternatively, if you're a casual and you just want to dabble in the system's offerings before committing to purchasing an AAA title, you can check out titles like Warframe, Blacklight: Retribution or DC Universe Online. As a third alternative, the PS4 also supports cross-platform purchases, so games like Flower and Sound Shapes are also available to those who purchased them for other PlayStation platforms. By comparison, it's terribly obvious that Sony offers the better deal based on what's available at launch and what you can access on a limited budget. The inclusion of the 30-days of PS Plus and a free $10 PS Store card is a great way to get people hooked on the service. For me, the big killer is the charge kit, which seriously should have been included with the Xbox One's final package. You can check out the comparison for the total price of both systems (tax not included) below.